About 55 km to go for Christian Kramer on the bike. It's a tough day but he still looks great. 50 km to go for the leader. Christian Kramer is in Tahiche - this means he has about 40 km to go. 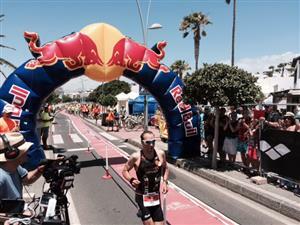 Let's have a look at Christian Kramer's IRONMAN history. He has done 12 IRONMAN since 2009 and one more IRONMAN-distance event. He has three podium finishes under his belt and managed a personal best as being runner-up in Austria last year in 7:54:31. He ran a 2:46:46 in Austria. So, let's make ready for a real running decision. Kramer has passed the 140-km-mark. Konstantin Bachor and Guy Crawford passed Bert Jammaer, they are in second and third now. We have double-checked our spotter information from the course if Bert Jammaer has been overtaken. He still is in second, that's what we hear from the course. Update men from our spotter team: At Tahiche Guy Crawford is in third, about five minutes behind Bert Jammaer in second. In fourth is Will Clark - 2 minutes behind second place. Alessandro Degasperi - a very strong runner - is another 30 seconds behind Clark. That will be an interesting battle on the run. We have several great runners in good positions. Decisions will be made on the run. 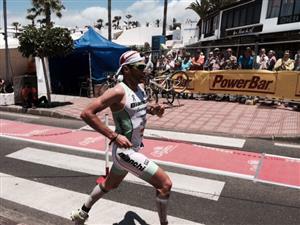 Even Miquel Blanquart seems to be in the mix, he is about 12 minutes behind second place. We are waiting for more information on the women's leaders. Diana Riesler is still in the lead. She has passed the village of Arrieta at Km 126. We will have an update as soon as possible. Christian Kramer is on the way to Puerto del Carmen. He has about 8 kilometers to go. T2 is preparing for Christian Kramer and some friends behind. 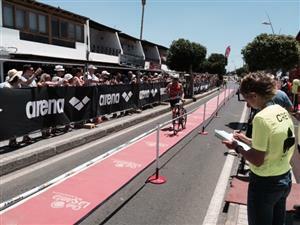 Through 150 km of the bike Diana Riesler is in the lead in Tahiche. We hear from the judges that Konstantin Bachor had to drop out of the race at about 160 km. The leader is coming to T2 in the next moments - the pursuers are Jammaer, Crawford, Degasperi, Clarke, Mauro Baertsch (Switzerland). The lead seems to be very huge for Diana Riesler. Our spotter says that her lead should be more than 10 minutes. Christian Kramer is off the bike - and looking strong. Michi Herlbauer is in second place at Tahiche - she is 13:30 minutes behind Diana Riesler. 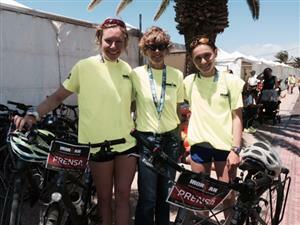 What a bike ride of Diana Riesler. Bert Jammaer is off the bike. The gap is 3:32. 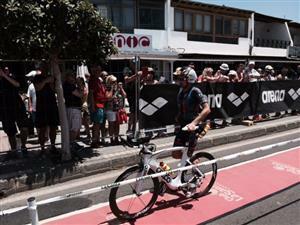 That was a windy bike ride: Christian Kramer had a split of 5:05:52. 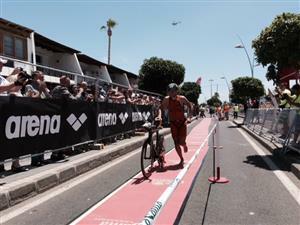 Mauro Baertsch from Switzerland surprised the crowd in third place, in fourth Alessandro Degasperi came off the bike. Fifth Will Clarke, in sixth is Guy Crawford. Dave Rost from the Netherlands is the fastest age groupe athlete so far - in 12th place. T2 is waiting for the leader in women's race. Rough conditions today: Christian Kramer (5:05:52) and bert Jammaer (5:09:28) were the only athletes to ride a sub 5:10. Diana Riesler is off the bike - her split: 5:37:12. Jammaer has made up a minute on Kramer since he started the run. Degasperi has made up more than 2:40. Baertsch is at 9:13 in fourth, Clarke is at 10:34 in fifth. Michi Herlbauer is off the bike. What a lead for Diana Riesler, Herlbauer is at 18:50. Out on the course to help with infos: Thanks, run spotters! Km 12.5: Degasperi is in third place, 6:04 behind Kramer. In 4th is Baertsch (+9:00), in 5th Clarke (10:27). 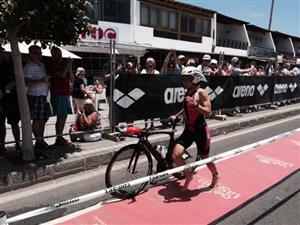 Caroline Livesey is off the bike - the third woman is about 25 minutes behind the lead.